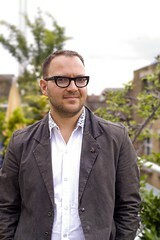 Library offers live chat with Cory Doctorow! Portrait, home, Hackney, London (by Paula Mariel Salischiker, pausal.co.uk, CC-BY) Uploaded by gruntzooki on 25 Aug 09, 2.15AM PDT. When he ditches school one Friday morning, 17-year-old Marcus is hoping to get a head start on the Harajuku Fun Madness clue. But after a terrorist attack in San Francisco, he and his friends are swept up in the extralegal world of the Department of Homeland Security. After questioning that includes physical torture and psychological stress, Marcus is released, a marked man in a much darker San Francisco: a city of constant surveillance and civil-liberty forfeiture. Encouraging hackers from around the city, Marcus fights against the system while falling for one hacker in particular. The webcast will be presented at 8:00AM on Wednesday, April 21, at the North Natomas Library. This is a very cool and special event. I hope enough people show up! Next Next post: GreenBeet on TV Tonight!